These are my new favorite snack. The coffee flavor that’s been added is subtle. And not at all sweet. I haven’t tried the other flavors. So far I’ve only been able to find these at the Speedway on W 150th. 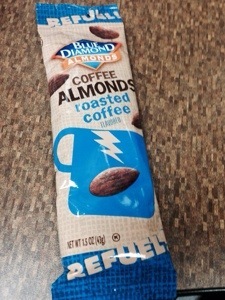 This entry was posted in I Can Have and tagged almonds, AWWWWYEAHHHHHHHH, coffee, FTW, nuts. Bookmark the permalink.